gazing at his own reflection. How I am loved by all. My tale’s bound to enthral. And end inside my head. Regard the words I’ve said. And no applause I hear. How ugly I can be. Again the world will see. The wonder that is me. 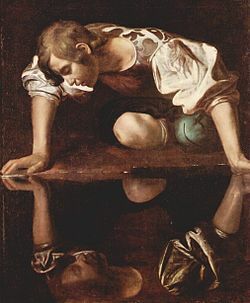 This entry was posted in Life & Living and tagged human nature, life, narcissistic personality disorder, narcissus, NPD, poem, poet, poetry. Bookmark the permalink. Wow! This is fantastic! I love it. A very well written poem Norma and a good one for the “me” generation. Made me smile – guess we all know someone like this! Amazing poetry and very good artwork. Good to learn to appreciate who we are.